I left work after my lecture yesterday and headed for the airport for my flight to San Diego. I had plenty of time to get there, and I now have the awesome TSA Pre√, so no taking off my shoes. The main parking lot was full, so I had to park in the overflow lot and walk about a mile, but it was a nice day, so no big deal. 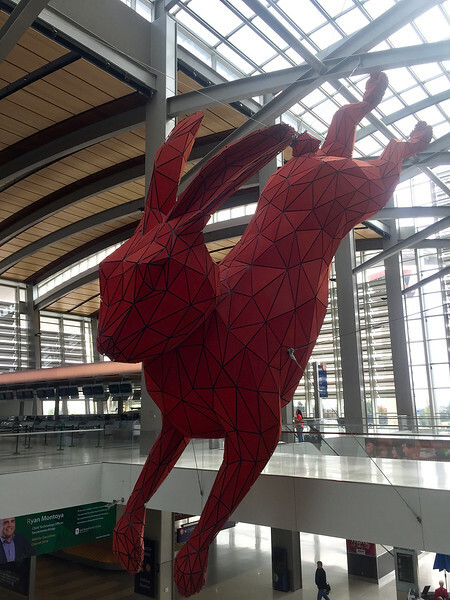 The airport rabbit. My favorite thing about this airport. The flight was uneventful, though crowded. It was about nap time, so I closed my eyes for most of it. Not quite a nap, but restful nevertheless. As we flew into San Diego, I could see the Marine Corps boot camp next to the airport. I thought back fondly to my boot camp days in Texas. If they really liked me, they would only have two seats in a row instead of three. Or give me my own plane--made out of solid gold. 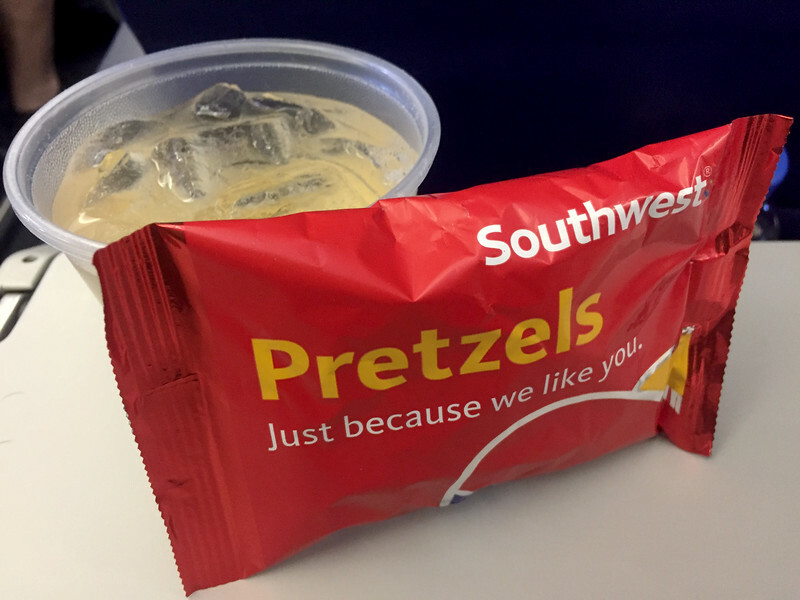 Pretzels and ginger ale are nice, though. I caught a Lyft ride at the airport and had a very pleasant and talkative driver who was from Uzbekistan. There was some traffic, but he negotiated it quite creatively, and we got to the hotel in less than a half-hour. My niece Candyd lives down here, and she and her boyfriend came and picked me up and took me to dinner. I hadn't seen her for more than a year, so it was good to catch up. They took me to their favorite Italian place, in a cool neighborhood. We got all caught up on each other's lives, and I got a chance to get to know Julian, the guy she's been with for a few years now. They have a house together, and took me to see it after we ate. 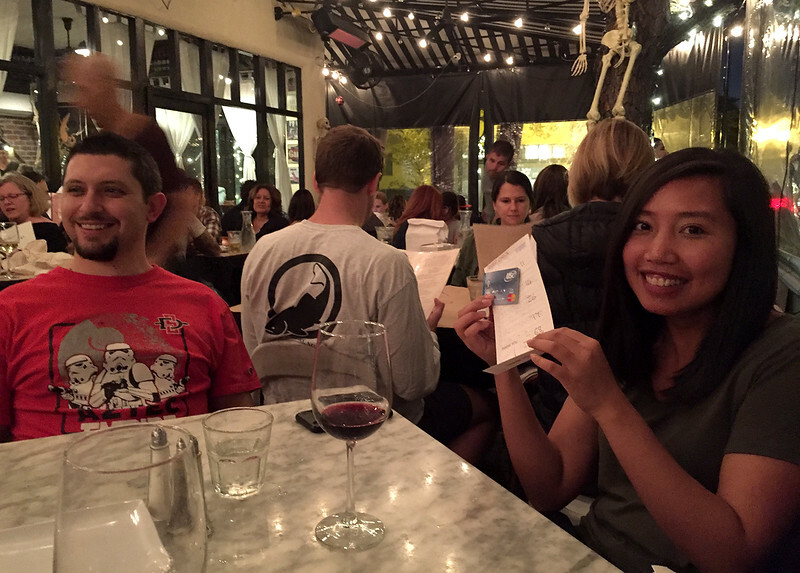 Candyd insisted on paying the bill for dinner, and saw it as a rite of passage, so I immortalized the moment with a picture. She seems really grown up now, not just practicing being grown up. She is a researcher for a big drug company, and has a really stable life. I am so happy to see her all settled. We had a great visit. Our conference doesn't really start until about 2 this afternoon, so I have a free morning. My boss and her husband are here, and I think we might go out to the beach this morning to walk around and take some pictures.